The REVEAL for Church: Spiritual Life Survey is designed to provide substantial, actionable insights into the spiritual life of your church congregation. More than a collective personality test, the survey collects and analyzes data about individuals in your congregation, curating that data to create an astute and detailed portrait of your church as a whole. 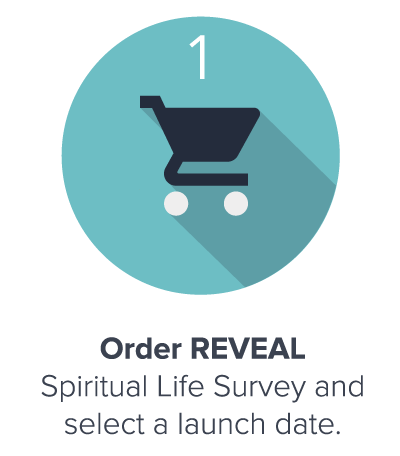 The REVEAL for Church: Spiritual Life Survey is designed to provide substantial, actionable insights into the spiritual life of your congregation. The survey collects and curates data to create an astute and detailed portrait of your church as a whole. See the areas where church members are growing - and where they’re not. Learn how they’re experiencing their relationships with Christ, and how your church can meet their spiritual needs with more impact. We’re here to help bring data and congregations together in a fun, cutting edge, and healthy way that assists churches who desire to grow in the right directions. Utilize the REVEAL for Church survey to make more informed decisions about how to manage your church’s human and financial resources, plan your programming, and strategize for future growth. The survey was designed by leading research experts. Since 2005, more than 2,000 churches representing more than 500,000 congregants have responded to the survey. The resulting database is a one-of-a-kind resource for understanding spiritual growth and church health. Our lead researcher, Dr. Nancy Scammacca Lewis, is an expert in quantitative methodology, with an M.A. from Wheaton College and a Ph.D. from The University of Texas at Austin. REVEAL does not asses church health simply on the basis of church inputs (like attending services and programs), but rather primarily on outputs -- what is actually happening in the lives of their congregation. REVEAL’s 100+ questions cause congregants to reflect on eight categories of questions, including their daily spiritual habits, their community involvement, their view of the church’s leadership and ministries, and their own spiritual beliefs and attitudes. Answers to the questions are aggregate and anonymous, so your members can participate freely and openly. We look forward to beginning a conversation about how REVEAL can work for you.